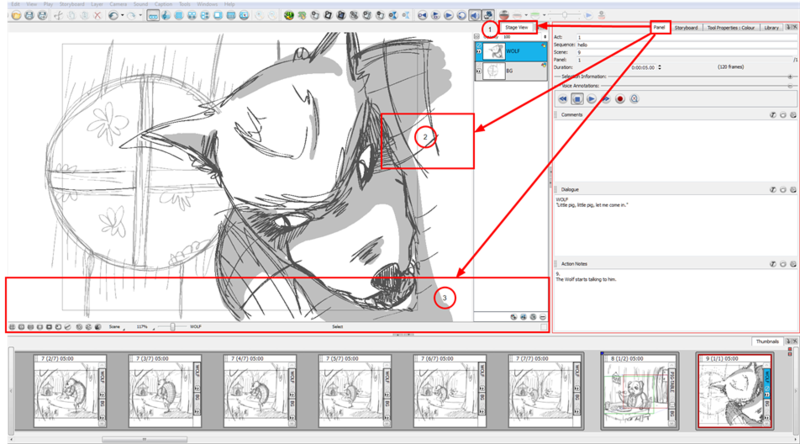 The Storyboard Pro user interface is comprised of different views, each one designed for a specific purpose. This section explains how you can modify the location and accessibility of the views by adding a new view as a tab or as a window. You can also swap the view locations around. NOTE: By default, Workspace modifications are automatically saved. You can restore the default workspaces by selecting Windows > Restore Default Workspace from the top menu. You can deselect the Automatically Save Workspace option from the Preferences dialog box to prevent this behaviour—see User Interface Preferences - General Tab. 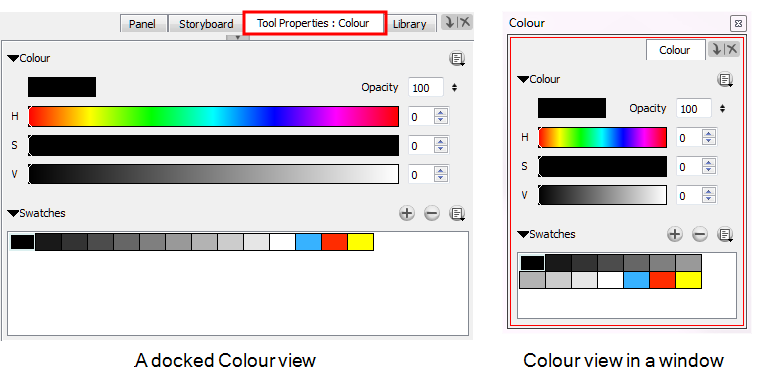 Views contain specific groupings of tools that are displayed in the Panel view or as windows that you can position anywhere on your screen. 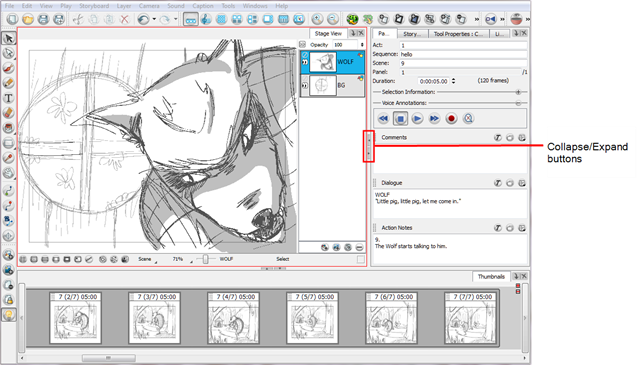 However, you can undock a view that is displayed in the Panel view. When you do this, it becomes a window. ‣ Select Windows > desired view. ‣ In a Panel view, click the View Menu button and select a view from the menu. 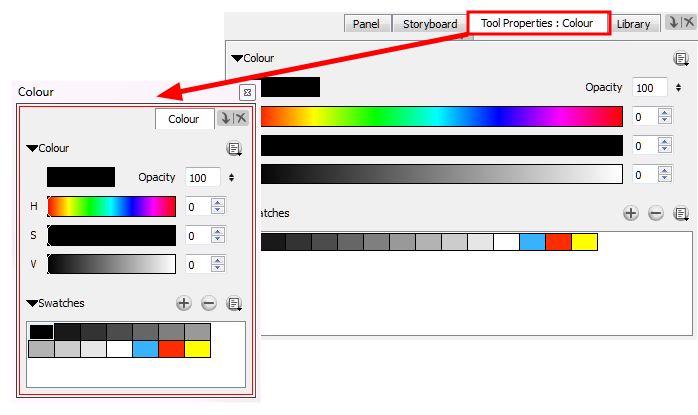 ‣ Drag the window’s tab onto the Panel view and dropping it in the tab area. ‣ In the Panel view, drag a view by the tab, moving away from the Panel view. You can rename a view’s tab temporarily. The new name will remain as long as the views stays open. Once closed and reopened, the tab will display the default name of the selected view. Type a new name for the tab you want to rename. The view tab is renamed. If you have several tabs in the same window, hold down [Shift] and click the Close View button to close all tabs together. Select the view tab and drag it onto one of the view’s separators, top area or onto another view’s tab. 1. The view becomes a tabbed window. 2. The view becomes a floating window. 3. The view becomes a new docked window. 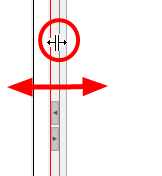 In the interface, position your cursor at the edge of the view you want to resize. You can also temporarily hide a view to gain more working space. The collapsed or expanded state of a view will be saved as part of the workspace modifications. The view is collapsed and only the Collapse/Expand button is visible. Click the Collapse/Expand button to display the view again.